Today I had a tremendous hankering for Skyline Chili. I drove over to the nearest Skyline and got a regular three-way, two cheese coneys with everything, a large water, and extra crackers. As I prepared to dig in I realized that not everyone may understand that there is one, and only one, correct way to eat Skyline Chili. As a public service, I offer a how-to manual on this essential life lesson. The first step in the consumption process is proper preparation of the chili plate. Begin by adding a liberal amount of the hot sauce that is kept in a squeeze bottle on every table in every Skyline restaurants. You should apply strips of the hot sauce, both vertically and horizontally, on top of the grated cheese, so that you end up with a kind of checkerboard pattern that will result in uniform hot sauce distribution. Then, take the the oyster crackers and carefully place them on the top of the grated cheese, creating an oyster cracker blanket. This timeless technique ensures that the lightly salted oyster crackers are properly spread across the chili. Now you are ready to dig in — and this is where many novices fail miserably. Recalling their days eating Chef Boyardee, they try to twirl the spaghetti, chili, and cheese on their fork. This is a pathetic blunder that is deeply embarrassing to every experienced Skyline patron in the restaurant. 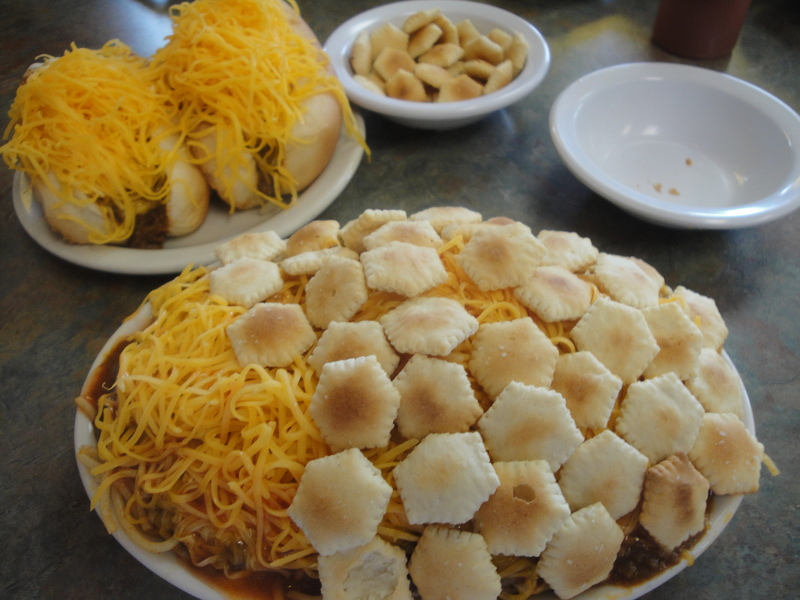 They realize that the only correct way to eat Skyline chili is by using the edge of the fork to cut down vertically through the cracker-cheese-chili-spaghetti mass, so that every bite is a small yet perfectly proportioned combination of spaghetti, sauce, cheese, and a cracker or two. This is why proper pre-consumption cracker placement is crucial. 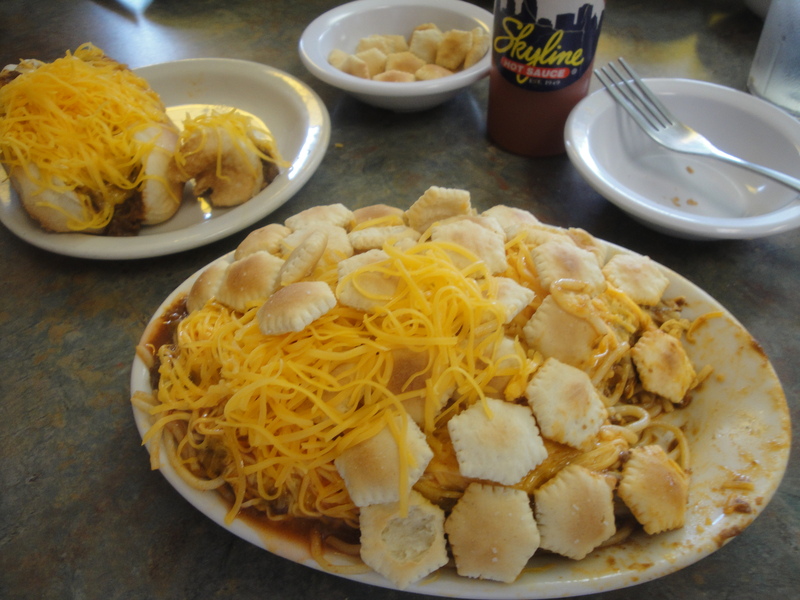 I prefer to eat my Skyline chili right to left, perhaps because I am right-handed. I suppose you also could eat a plate moving left to right. However, the key point is that you start at one end of the oval-shaped plate and move from side to side. This approach maintains the structural integrity of the food mass. If you begin in the middle of the plate, the risk is far greater that you will experience the dreaded cheese-cracker cave-in, and once that occurs you can never fully recover the initial flawless proportioning. As you consume this tasty concoction, be alert to the need for cracker conservation, and also to the hazards of cheese hogging. At some point, the cheese and sauce will have melded into a kind of melted cheesy shield that will skid over the top of the pasta. If you facilitate the skidding process, you may end up at the edge of the plate with no cheese — which is another appalling faux pas. Similarly, you want to have a cracker or two at the end of the plate to soak up those last few drops of cheesy/saucy goodness. Don’t be caught shorthanded! As you eat your three-way, you also should consume your coneys. Any cheese drop-off from the coney — and there inevitably will be some — should be added to the remaining cheese pile on your three-way plate. This necessarily means that you will consume the last of your cheese coneys before you finish your last bite of the three-way. After you have savored your last swallow of three-way and gone up to the cash register to pay for your fare, remember that the meal is not yet over. 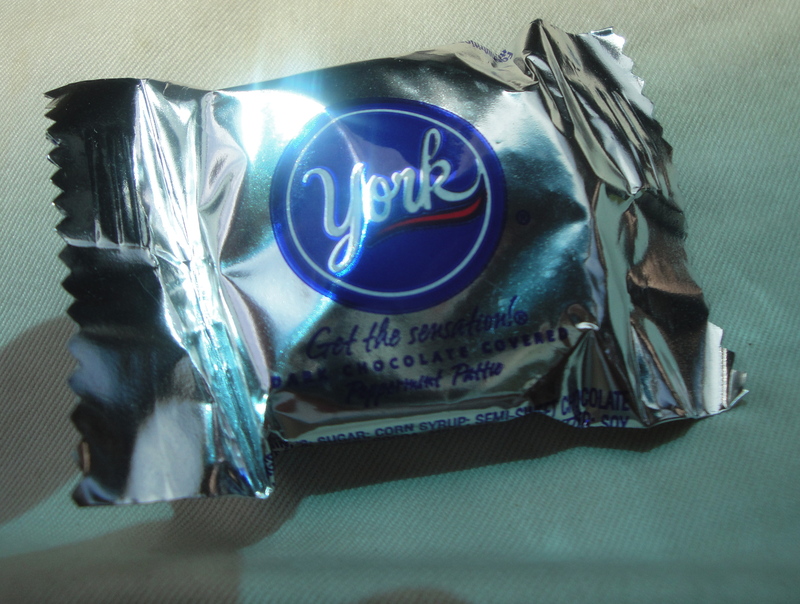 A crisp, refreshing mini York Peppermint Patty is as indispensable to the meal — and I do mean indispensable — as the extra bowl of crackers. 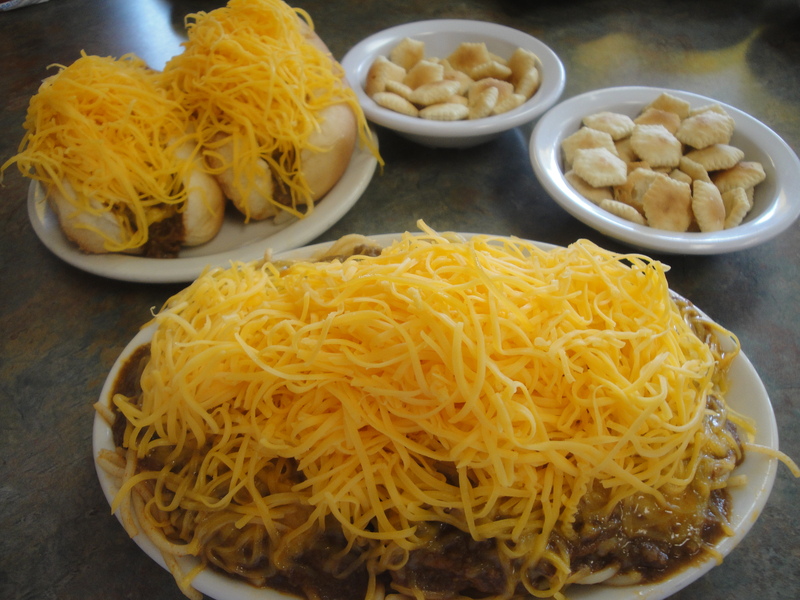 Correctly prepared and consumed, a three-way meal at Skyline Chili ranks among the finest fast food options the nation’s heartland has to offer. But, as with everything else, there is a right way to do it and countless wrong ways. Let’s get it right, America!